If you like to look things up yourself rather than ask for help, the Dragon website provides ample reference sources you can look through. If the particular problem you’re facing isn’t absolutely unique to your system (and most problems aren’t), chances are somebody has already asked Dragon’s tech support people about it. If someone has, you can look it up. When the technical support department staffers run into a new problem, they write down their solutions in their knowledgebase so that their own people can look it up rather than solve the same problem over and over again. Those answers are available to you on the website. From the front page of the Dragon website, click Support. Click the Get Support link under the Dragon NaturallySpeaking box. Scroll down to the center of the page and you’ll see a Search Nuance Knowledgebase prompt box. Type in the question for which you want an answer. Sometimes looking through the answers in order can be like searching for a needle in a haystack. Unless you know that the answer you want has been posted to the website in the last few days, you can look at a lot of message titles without finding what you’re looking for. Fortunately, Dragon provides an Advanced Search button to help you dig deeper. If you’re buying a new system or looking to upgrade part of the system you have, you can use the site’s Hardware Compatibility Guide to check whether Nuance has tested your system’s performance with NaturallySpeaking. 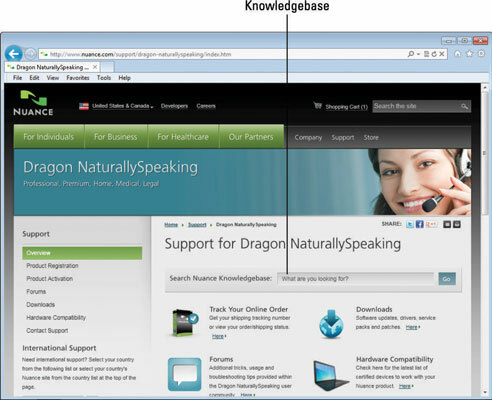 To access the Hardware Compatibility Guide from the Dragon home page, select Support from the menu and click Get Support under the Dragon NaturallySpeaking box. The Hardware Compatibility link is on the left side. When you arrive at the Hardware Compatibility page, click the kind of hardware you want to check out: microphones, notebook computers, desktop computers, recorders, sound cards, or miscellaneous to see a list of devices that Dragon has evaluated in its compatibility labs. On the same Support page, off the home page is a link to downloads that are available for your software. Click the Downloads link. On the same Support page, off the home page you will see the Product Activation link. Click this if you have questions about the activation process.